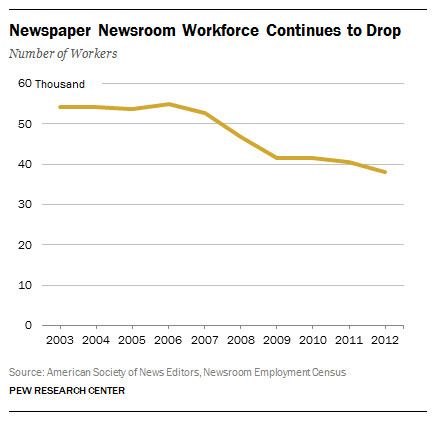 Overall, the decade-long trend in newspaper job losses continues. According to the annual American Society of Newspaper Editors survey, the number of full-time newsroom jobs in 2012 (the last year for which complete data are available) slipped to 38,000. That is the lowest number since the society began counting in 1978. In the decade from 2003 through 2012, a total of 16,200 jobs were lost according to the editors group. The recession years of 2008 and 2009 took a toll from which the industry never recovered. In 2007, there were 52,600 full-time newsroom employees. Two years later, that workforce had been pruned by about 20%. Although the editors association’s numbers for 2013 have not been released, the drumbeat of layoffs continued last year. According to various sources, including media accounts, several major companies eliminated hundreds of newspaper jobs in 2013, including two—Gannett and Tribune Co.—that invested more heavily in local television stations. At Gannett newspaper properties, estimates reached about 400 layoffs from all departments while the Tribune Co. announced about 700 cuts—not all of them in the newsroom either. Media reports put newsroom layoffs at The Cleveland Plain Dealer and the Oregonian in Portland at about 50 apiece in 2013. In one noteworthy cutback, The Chicago Sun-Times laid off its entire 28-person photography department in 2013. (Four were hired back in March 2014). In California, publisher Aaron Kushner, who attracted considerable industry attention and praise for hiring scores of new journalists and investing heavily in print journalism, ended up cutting about 70 jobs at The Orange County Register and The Riverside Press-Enterprise in early 2014, some outside the newsroom. Four top editors were among those who departed The Register. This overall trajectory has not kept some newspapers from aggressively replacing those lost to new digital venues, in some cases hiring people from the digital news sector. To replace tech columnist David Pogue, who left for Yahoo News, The New York Times hired Farhad Manjoo from The Wall Street Journal. Manjoo had come to The Journal from Slate, one of the earliest digital news outlets. The Times will have a 15-person staff producing “The Upshot,” the new politics and policy site that will, in part, fill the gap left by Silver’s departure. And The Washington Post moved quickly to replace Ezra Klein’s departed Wonkblog team, hiring such journalists as Emily Badger from the Atlantic Media Group and Jason Millman from Politico. 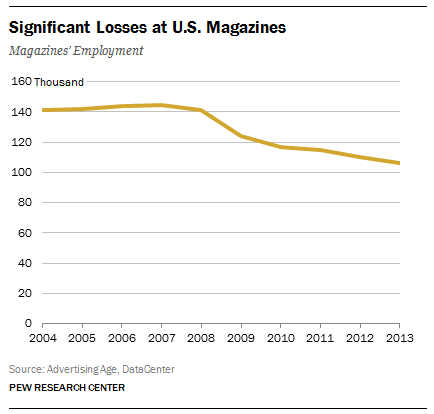 As with newspapers, the magazine sector has also been shedding jobs at a significant pace. Ad Age’s Data Bank, which tracks all magazine jobs (not simply newsroom jobs) for the entire consumer magazine business, found that the number of magazine jobs had shrunk by 35,000 in the last five years. The employment picture has not been much brighter in the smaller subset of news magazines. Of the three big newsweeklies that once dominated the market, U.S. News & World Report shuttered its print edition in December 2010 and Newsweek followed suit two years later, although it re-launched a print product in March. And as Time magazine’s parent company, Time Inc., prepares to spin off from its corporate parent, Time Warner, a reported 500 jobs will be lost there. The legacy broadcast news world has fared better in terms of jobs than the print newsroom, although meaningful data at the national level are hard to come by since the outlets themselves do not regularly report those numbers. At the local level, however, the numbers indicate a stable workforce. According to an annual survey produced by Hofstra University Professor Bob Papper, the total staffing level in local television newsrooms in 2012 was 27,605, the third-highest total recorded—behind only 2011 and 2000. But some of those journalists have been stretched thinner. In recent years, local television stations have been busy adding newscasts, particularly in the early-morning hours. More than 40% of the stations responding to Papper’s most recent survey said they increased news in 2012. At the national cable news level, the three main competitors cite the same overall staffing numbers they have used for years. CNN and its sister network HLN laid off more than 40 senior journalists late last year, but CNN uses its longstanding staff number of 4,000. MSNBC and the Fox News Channel have both declined to provide staffing numbers in recent years, saying it is too difficult to come up with an accurate count. In a study of cable news content in the 2013 State of the News Media Report, Pew Research did find that between 2007 and 2012, the percentage of time devoted to interviews during the daytime increased to 51% from 39% while the time devoted to breaking news events and live staff reports dropped t0 23% from 33%. Covering live events with correspondents is considerably more labor- intensive and costly than airing interviews. Tracking staffing numbers from the three broadcast networks that provide news is difficult, but all have implemented cutbacks in recent years. According to media accounts, about one-quarter of the ABC News staff departed in 2010. That same year, dozens of CBS News staffers reportedly lost their jobs in financial belt-tightening at the network. Hundreds of jobs were lost at NBCUniversal in 2008 as part of an effort to reduce the budget by $500 million. There has been a long downward trend in the size of network news staffs. In its 2008 State of the News Media Report, Pew Research cited journalism professor Joe Foote’s finding that there had been a 35% drop in the number of reporters appearing on the evening network newscasts from 1985 to 2002. Using a different methodology—relying on how the networks reported their own staff numbers to the New Media Yellow Book—Pew Research estimated that overall network news staffing had dropped 10% more between 2002 and 2006.